If you have been in a car accident in West Virginia, there are some things you need to take care of right away. It’s important that you make a full recovery as soon as possible. That might mean having an attorney to represent you and guide you through the process and protect your rights. If you have been injured, or think you may have been injured, it’s important that you act quickly. There are some specific requirements under the law and things you should or should not say to your insurance company to make it all easier. If you are experiencing these symptoms, call your doctor right away. It’s important to have a full evaluation as soon as possible. In West Virginia, you have five days to report an accident with damages over $500 to the county or city police. They will have their own procedures for the report, so it’s best to contact the right authorities in the location where the accident took place. If you have a minor fender-bender, you may have felt at the time that it was not worth reporting. This is a common mistake, because that $500 limit is reached easily with the cost of repairing cars. If you have been injured it will almost certainly be reached. If you don’t report an accident, it may be impossible to make a claim with your insurance no matter what. Like most states, West Virginia law requires that the insurance carried by the driver who is at fault cover all the costs. It may result in litigation, especially in the case of an injury. After your own recovery, this is the second big reason why a proper evaluation is needed right away after an accident. The insurance company will want to interview you as soon as possible to determine who is at fault, regardless if the other party was ticketed. It’s important that you have an attorney who is experienced with this and can handle the call for you. They have their tricks, so it’s best to know exactly where you stand before you talk to them. It may seem like a lot of bother to hire an attorney, but if you have been injured it’s absolutely vital. You will need representation to protect your rights and get what you need for a full recovery. Do not delay if you even think you may have been injured, as any problems will only become worse with time. 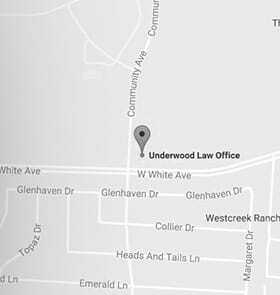 The injury lawyers at Underwood Law Office are ready to help you recover the maximum compensation available for your injury case. Our Huntington, West Virginia attorney office represents clients across the entire state. Call our toll-free number 844.UNDERWOOD (844.863.3796) for a free consultation about a fair settlement. You pay no fee unless we win.